The Dealhack Teacher Discounts List is the result of our quarterly survey of brands that offer discounts to teachers. Every three months we independently verify each and every store on this list. The list, which is broken down into 19 categories, can be downloaded and used as the ultimate reference guide to teacher savings. 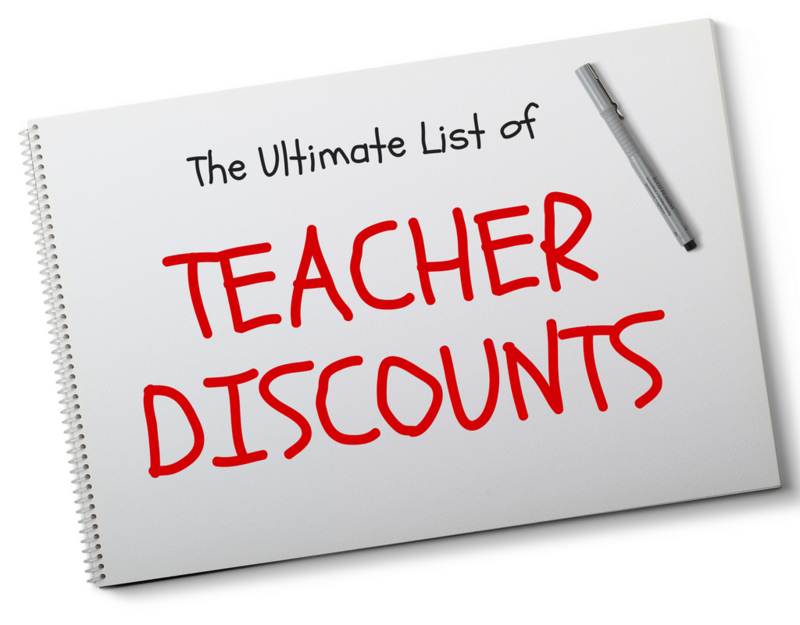 Download the Teacher Discounts List in PDF format here. Academic Superstore: The Academic Superstore offers year-round discounted school supplies to U.S. educators (source). Container Store: The Container Store offers special discounts to U.S. teachers through their Organized Teacher Discount Program. Teacher identification must be verified (source). Curious Chef: Curious Chef offers educator discounts on bulk kitchen products for verified cooking educational programs in the U.S. (source). DickBlick Art Supplies: DickBlick Art Supplies offers exclusive school discounts and free lesson plans to U.S. educators as well as Art Room aid to qualifying U.S. schools (source). Discount School Supply: Discount School Supply offers discounts school supplies to U.S. educators (source). Dollar Days: Dollar Days offers discounted wholesale prices on classroom supplies for teachers (source). Dramatists Play Service: Dramatists Play Service offers a 10% discount when ordering twenty or more copies of any DPS Acting Edition to accredited schools across the nation (source). G.Willikers Toy Shop: G. Willikers Toy Shop offers an exclusive discount to U.S. teachers on all orders placed for classroom use (source). Hobby Lobby: Hobby Lobby offers a 10% discount to U.S. educators on supplies purchased for classroom use. Items must be paid for using a check or bank card provided by the school (source). Home Depot: U.S. educators can apply for a tax-free exemption on classroom purchases made at Home Depot (source). K12 School Supplies: K12 School Supplies offers a 30-80% discount on closeout and clearance school supplies for educators (source). Kennelly Keys Music: Kennelly Keys Music offers U.S. music teachers a 20% discount on all orders of books and sheet music. Educator ID must be presented at check-out (source). Kiwi Crate: Kiwi Crate offers special educator discounts on bulk classroom orders with valid teacher identification (source). LakeShore Learning: LakeShore Learning offers U.S. teachers 15% off online orders after joining the LakeShore Learning Teacher’s Club (source). Naked Binder: Naked Binder offers special discounts to U.S. educators on their non-toxic, environmentally safe, and 100% recyclable school products. Valid teacher identification is required (source). National School Supply: National School Supply offers discounted educator rates on school supplies, resources, and equipment (source). OfficeDepot: OfficeDepot/Office Max offers members of their free rewards program a 10% discount on school supplies (source). Paper Source: Paper Source offers U.S. teachers a 15% discount on purchases made between select dates in September. Valid teacher identification is required (source). Pets in the Classroom: Pets in the Classroom offers grants to qualified U.S. schoolteachers for the purchase of small pets for student education and interaction within the classroom (source). Raymond Geddes School Supplies: Raymond Geddes School Supplies offers exclusive discounts on future orders to U.S. teachers through their Get More Rewards Club (source). Silhouette: Educators in the U.S. and Canada are eligible for a discount on Silhouette products (source). Yoobi: Yoobi offers free classroom packs for elementary school educators who have 70% or more of their students enrolled in a free or reduced lunch program through the Kids in Need Foundation (source). Barnes & Noble: Barnes & Noble offers U.S. educators 20% off the publisher’s price for books purchased exclusively for classroom use, as well as 25% off the publisher’s book prices on select Educator Appreciation Days (source). Bookmans: Bookmans offers U.S. educators a 20% discount on all purchases after signing up for their Project Educate program (source). First Book: First Book offers U.S. Educators between 50-90% off retail book prices for select low-income communities. Certain limitations apply (source). Scholastic Teacher Store: Scholastic offers exclusive teacher discounts on all orders placed through the Teacher Store (source). Thrift Books: Thrift Books offers U.S. educators 15% off all used class book sets purchases. Valid teacher ID is required (source). A.C. Moore: A.C. Moore offers U.S. educators 15% off the entire purchase of regular and reduced price items. Valid teacher identification must be provided at check-out (source). JoAnn Fabric: JoAnn Fabric offers an exclusive 15% discount both in-store and online to U.S. teachers who show proof of identification (source). Michaels: Michaels offers 15% discount on in-store purchases every day to U.S. teachers who show valid teacher identification (source). Banana Republic: Banana Republic offers U.S. teachers a 15% discount on full-priced orders. Offer is not valid at Banana Republic Factory Stores. Teacher identification must be presented at checkout to receive your discount (source). Bonobos: Bonobos offers U.S. teachers a 15% discount on the first five orders after verifying teacher identification through Sheer.ID (source). Costco WholeSale: Costco WholeSale offers U.S. teachers who sign up for a new membership over $50 in exclusive savings. Teacher identification is required (source). Hershey’s Store: The Hershey’s Store offers a 20% education discount to U.S. teachers. Identification must be verified through the Hershey Store website (source). J.Crew: J. Crew offers U.S. teachers a 15% discount on in-store purchases. Valid teacher identification must be provided at checkout to receive discount. Certain exclusions apply (source). Karen Kane: Karen Kane a 25% discount on purchases to U.S. teachers with valid teacher identification (source). Madewell: Madewell offers U.S. teachers an exclusive 15% discount on in-store purchases when a valid teacher ID is presented at check-out (source). OneHanesPlace: OneHanesPlace offers a 10% teacher discount to current and retired U.S. educators who verify their identification through TeacherID (source). Overstock.com: Overstock.com offers free Club O Gold memberships to U.S. educators. Identification must be verified through TeacherID (source). Staples: Staples offers exclusive back to school savings to U.S. educators after identification is verified through staples.com (source). Talbots: Talbots offers U.S. teachers a 15% discount on regular priced items. Valid teacher identification must be provided at checkout to receive a discount (source). TOMS: Teachers who verify with SheerID save 10% at TOMS (source). Contiki: Contiki offers up to $75 in savings on Contiki trips of seven or more days to U.S. educators. Valid teacher identification is required (source). VacationstoGo: VacationstoGo offers limited vacation cruise line deals to U.S. educators. Valid educator identification is required (source). Aston Hotels & Resorts: Aston Hotels & Resorts offers U.S teachers a 10% discount on all hotel and condominium room rates, in addition to other complimentary services and exclusive offers (source). Bally’s: Bally’s offers U.S. educators 10% off their stay as well as other exclusive promotions and deals. Identification must be verified through TeacherID (source). Caesar’s Palace: Caesar’s Palace offers U.S. educators 10% off their stay in addition to other special offers. Identification must be verified through TeacherID (source). Coral Cay Resort: Coral Cay Resort offers exclusive vacation packages to U.S. educators. Educator identification is required (source). Cromwell: The Cromwell offers an exclusive 10% discount to teachers across the nation as well other exclusive offers. Identification must be verified through TeacherID (source). Enclave Hotel and Suites: The Enclave Hotel and Suites offers an exclusive educator discount as well as complimentary transportation to Universal Orlando (source). Flamingo: Flamingo offers a 10% reduced room rate in addition to other special discounts to U.S. teachers. Identification must be verified through TeacherID (source). Galleria Palms Hotel: The Galleria Palms Hotel offers a special teacher appreciation rate to U.S. teachers. Teacher identification must be verified (source). Gaylord Palms Resort: The Gaylord Palms Resort offers U.S. teachers a limited time exclusive savings on room rates. Teacher identification is required (source). Hawk’s Cay Resort: Hawk’s Cay Resort offers a yearlong Teacher Appreciation special on vacation packages to U.S. teachers. Certain exclusions apply (source). Hilton Bonnet Creek: The Hilton Bonnet Creek offers U.S. educators exclusive discounted room rates in addition to other discounts and complimentary deals (source). Horseshoe: Horseshoe offers U.S. teachers 10% discounts off their stay in addition to exclusive offers and promotions. Identification must be verified through TeacherID (source). Lake Buena Vista Resort Village & Spa: Lake Buena Vista Resort Village & Spa offers exclusive vacation packages to U.S. educators (source). Mermaid Cottages: Mermaid Cottages offers a year-round 5% discount to all educators with teacher identification (source). Planet Hollywood Resort: Planet Hollywood Resort offers educators across the nation an exclusive 10% discount as well as other special offers once identification is verified through TeacherID (source). Preferred Hotels & Resorts: Preferred Hotels & Resorts offers a special 20% off educators rate as well as complimentary amenities and discounts. Certain restrictions apply ( source). Prince Resort: Prince Resort offers an exclusive educator discount on room rates. Valid educator identification must be presented at check-in to receive your discount (source). Rio Las Vegas: Rio Las Vegas offers an exclusive 10% discounted room rate to U.S. teachers in addition to other special promotions once identification has been verified through TeacherID (source). Stay Sky Suites: Stay Sky Suites offers U.S. educators exclusive discounts and complimentary services. Valid educator identification is required (source). Swan and Dolphin Resort (Walt Disney World): The Swan and Dolphin Resort at Walt Disney World offers U.S. educators a special teacher room rate with valid teacher identification (source). Westgate Resorts: Westgate Resorts offers a 10% discount on room rates to U.S. educators with valid teacher identification (source). Wyndham Hotel Group: Wyndham Hotel Group offers special discounted rates to U.S. educators. Teacher identification is required (source). Buick: Buick offers special educator discounts to U.S. teachers with valid teacher identification (source). Chevrolet: Chevrolet offers exclusive discounts to current U.S. educators through their Educator Discount Program (source). GMC: GMC offers exclusive discounts to U.S. educators through their GM Educator Discount program. Valid teacher identification is required (source). Budget Truck Rental: Budget Truck Rental offers U.S. teachers a 20% truck rental discount on local moves, and a 15% discount on one-way movies on both weekdays and weekends (source). E-Z Rent-A-Car: E-Z Rent-A-Car offers a 10% discount on car rentals to U.S. educators with valid teacher identification (source). Sixt Rent a Car: Sixt Rent a Car offers U.S. educators an exclusive car rental coupon for online reservations at select Sixt Rent a Car locations (source). Adafruit: Adafruit offers U.S. educators exclusive discounts and offers on the purchase of Adafruit and Arduino products (source). Adobe: Adobe offers exclusive teacher discounts on Adobe software products, like 60% off their first year of Adobe Creative Cloud. Certain exclusions apply (source). Apple Store for Education: The Apple Store for Education offers U.S. educator discounts on the purchase of a new mac or ipad. Certain limitations apply (source). AT&T: AT&T offers select educator discounts on monthly phone service plans through AT&T’s Signature Discount Program. Certain eligibility requirements apply (source). Basecamp: Basecamp gives free memberships to U.S. educators who agree to use the site for educational purposes only. Valid teacher identification is required (source). Bose: Bose offers special discounts to U.S. educators with proof of teacher identification (source). Canon: Canon offers nationwide discounts to U.S. educators on select educational products with valid educator identification (source). Chibitronics: Chibitronics offers a 10% educational product discount to teachers who wish to incorporate Chibitronics into their programs (source). Devon Technologies: Devon Technologies offers an exclusive educational discount to U.S. educators with valid educator identification (source). Hewlett Packard: HP Academy offers a 20% discount to U.S. educators on select HP products as well as free shipping on all orders (source). JourneyED: JourneyED offers discounted software and technology products to U.S. educators with valid educator identification (source). Lenovo: Lenovo offers reduced prices on select desktop computers, laptops, and tablets to U.S. educators through their Academic Purchase Program (source). LittleBits: LittleBits offers U.S. educators 5% off of all products with valid teacher identification (source). Microsoft Store: Microsoft offers U.S. educators free and discounted tools to use in the classroom. Valid teacher identification is required (source). Roxio: Roxio offers special pricing on select Roxio products to U.S. educators with valid teacher identification (source). Silhouette: Silhouette offers U.S. educators special product discounts through their Educator Discount Program (source). Sony Creative Software: Sony Creative Software offers special academic pricing to U.S. educators on select software products with proof of teacher identification (source). Sprint: Sprint offers 20% off personal monthly service plans to U.S. educators who participate in the Sprint Discount Program. School eligibility requirements are listed on the Sprint website (source). Studica: Studica offers U.S. educator discounts on select technology and software products (source). ThinkEDU.com: ThinkEDU.com offers exclusive educator savings of up to 85% off the purchase of popular computer software programs (source). T-Mobile: T-Mobile offers exclusive education discounts on monthly phone service plans for k-12 U.S. educators. Valid educator identification is required. Certain exclusions apply (source). Verizon Wireless: Verizon Wireless offers exclusive monthly phone service discounts to select U.S. education employees. Contact Verizon Wireless for details and eligibility requirements (source). Vimeo: Use the code DHTEACHER25 to save 25% on Vimeo Plus and PRO (source). Ziload: Ziload offers special educator discounts on select products. Valid teacher identification is required (source). Garmin: Garmin offers exclusive educator discounts on select products for the classroom. Valid teacher identification is required (source). Kaylaitsines: Kaylaitsines offers an exclusive discount to U.S. educators. Identification must be verified through ID.me (source). PureFormula: PureFormula offers U.S. teachers a 10% discount on all orders. Identification must be verified through ID.me (source). ThriveMarket: ThriveMarket offers free memberships and 25% off first time online orders to U.S. educators who verify their identity through ID.me (source). YogaKids: YogaKids offers U.S. teachers 25% off all foundation training with valid teacher identification (source). 23andMe: U.S. teachers receive special education discounts on all DNA kits ordered through 23andme.com after teacher identification has been verified (source). National Geographic & Ancestry DNA: National Geographic and Ancestry DNA partner up to offer exclusive educator discounts on the Geno 2.0 kit for classrooms through the Genographic Project. Educator identification must be verified (source). Horace Mann Insurance: Horace Mann offers exclusive educator discounts on auto, life, and property insurance premiums to U.S. teachers. Certain exclusions apply (source). Liberty Mutual Insurance: Liberty Mutual Insurance offers special auto insurance coverage exclusively for U.S. educators at no additional cost (source). American Federation of Teachers: The AFT Advantage card offered through the American Federation of Teachers offers exclusive discounts on wireless rates, shopping, magazine subscriptions, and auto purchases to discount cardholders (source). Educators Travel Network: For a membership fee of $36 a year, teachers across the nation are offered discounted travel rates of just $45 a night (source). Nea Magazine Service: Nea Magazine Service offers educator discounts on select popular magazine subscriptions (source). StudentMags: StudentMags offers U.S. educators special discounted rates on select popular magazine subscriptions (source). The New York Times: The New York Times offers exclusive discounts for both online and print subscriptions to U.S. educators who present valid educator identification (source). Time Magazine for Kids: Time Magazine for Kids offers exclusive educator discounts on bulk orders in addition to education resources and guides for U.S. teachers (source). USA Today: USA Today offers up to 45% off classroom subscriptions to U.S. teachers to use for educational purposes (source). Wall Street Journal: The Wall Street Journal offers an exclusive educator rate for print or digital subscriptions. Valid educator identification is required (source). My Alarm Center: My Alarm Center offers exclusive nationwide discounts on home security systems to U.S. educators with valid educator identification (source). Cincinnati Reds: The Cincinnati Reds offers U.S. teachers half-priced tickets on select games (source). Columbia: Columbia offers special discounts on Columbia products to U.S. educators. Teacher identification is required (source). Goruck: Goruck offers U.S. educators a 25% discount on orders. Verification through TeacherID is required (source). Tampa Bay Rays: The Tampa Bay Rays offers k-12 U.S. educators complimentary tickets to select games and events (source). CoolFrames.com: Coolframes.com offers U.S. educators 5% on all online orders in addition to $20 off each purchase over $200. Verification through ID.me. is required (source). Lasik Plus: Teachers are eligible for a 20% discount (source). Crayola Experience: The Crayola Experience in Orlando offers all U.S. educators complimentary admission with valid teacher ID (source). OTL Seat Filler Club: Teachers pay just $22 for the first three months of membership as well as $8.50/month discounted membership dues (source). SeaWorld Parks & Entertainment: Sea World in Florida offers one complimentary admission per year for certified k-12 teachers who work in the state of Florida. Teachers must sign up with ID.me for verification and to receive a voucher. Certain restrictions apply (source). Party City: Party City offers exclusive education discounts on in-store purchases to all U.S. schools and non-profit organizations. Certain restrictions apply (source). Shindigz: Shindigz offers U.S. educators a 15% discount on all orders. Valid teacher identification is required (source).